Though we often love to bring our furry friends along with us on trips, doing so isn’t always a viable option. Airline restrictions, legal constraints, and your pet’s temperament may prevent you from bringing your cat or dog with you while traveling. For times when you find that you can’t bring your cat or dog along for the journey, it’s important to find proper accommodations for them at home. Many pet owners choose to board their pets at a kennel while they’re away. Though this is a useful option for many cats and dogs, it requires certain preparations to ensure that your animal stays happy and healthy during their stay. To this effect, we’ve created this list of important considerations to keep in mind when preparing your pet for their stay at a pet kennel. One of the most important preparations for leaving your pet in a kennel is to have them kennel trained well before they need to board away from home. Getting your pet used to a carrier or kennel can prevent unneeded stress caused by the experience of boarding in an unfamiliar location. Additionally, dogs are naturally den animals, meaning they prefer to sleep in relatively small enclosures. Pets accustomed to a kennel or carrier may also have better experiences at the groomer or the veterinarian. Because pet groomers and veterinarians often place pets in a kennel or containment area, kennel training can prevent anxiety from afflicting your cat or dog when being bathed or undergoing a check-up at the vet’s office. No matter how long your pet is boarding, certain accommodations should be available at every boarding facility. It’s important to ensure that animals staying at a given location always have access to clean water and nutritious food. Pets should also have proper shelter placed in a comfortable climate with a controlled temperature. Dogs should be kept in aptly sized kennels with a separate whelping area available for dogs that are experiencing stress or exhibiting behavioral problems. Cats should have kennels in a separate location with scratch posts and clean litter boxes available. It’s also important to know that the staff spends plenty of individual time with each animal to ensure that they are happy during their stay. 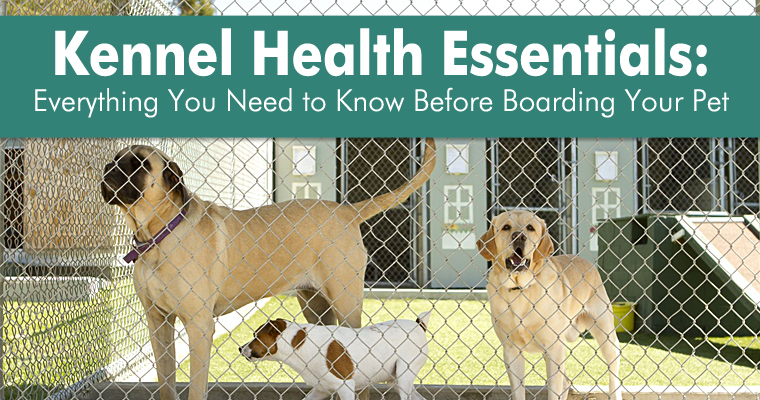 Boarding in an unfamiliar location with other animals can be an extremely stressful experience for your pet. This stress can not only cause your pet to act out but it can also wreak havoc on your pet’s immune system and digestive health. Calming treats and supplements, like Bonies Calming Formula and Tranquil Tabs, can certainly relax your pet with natural ingredients like chamomile and tryptophan; however, you may also consider using supplements to improve immune and digestive functions. One of the best ways to improve both immune health and digestive function is with probiotic supplements. Probiotics work to promote a healthy balance of bacteria in your pet’s gut that facilitate the breakdown of food and play a vital role in your pet’s overall immune health. One of the best probiotic supplements available is Proflora, which supplies more than 200,000 colony forming units of beneficial bacteria to the gastrointestinal tracts of cats and dogs alike. Feline Immunodeficiency Virus (FIV) Leptospira spp. It’s also important to prevent the spread of parasites by ensuring that your pet is treated with a proper preventive. Frontline Plus is one brand that works particularly well in kennels because the active ingredients are safe for both cats and dogs. It can also be useful to use a prescription heartworm preventive like Heartgard, which protects cats and dogs against a variety of internal parasites. Kennels are a perfectly safe option for your pet that can be a lifesaver in a tight-spot; and though it’s better to leave your pet at a kennel than home alone, there are other pet care options available that may be better for your cat or dog. If at all possible, try to leave your pet with a trusted friend that is experienced with animals to ensure that they receive individual attention and specialized care each day that you’re away. Services like DogVacay may also provide a more ideal solution to your pet sitting needs. Touted as “Airbnb for Dogs”, this service connects pet owners around the nation with extremely qualified individuals willing to provide pet sitting services in their area. The multi-million dollar company has been featured in countless pet periodicals for its incredibly effective screening process that consistently selects only the crème of the crop when it comes to pet sitters.